Hello, I am Sergeant Jason Chickowski of the Chatham-Kent Police Service. 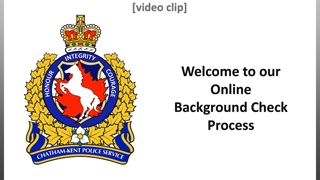 Welcome to our online background check process, where you can complete a police screening check from the comfort of your home, 24 hours a day 7 days a week. There's no need now to take time off work, drive to your local police station, and wait in our lobby, when you can do it from the comfort of your home. On our website you'll find information on both levels of police screening checks available to you. We encourage you to read carefully and make the correct choice. You can also speak to your employer and let them help you determine which police check is most appropriate for the position to which you are applying. Payment is handled through a secure online processor, similar to any other website on the internet. Our website includes online authentication which is necessary as police services will not release information unless your identity has been confirmed. Authentication is performed by our partners, Forrest Green/TransUnion who are licensed credit consumer credit reporting agencies. You will be asked a series of questions regarding your banking and credit history, the answers to which only you will know. Your credit file is not shared with the police; it's merely a process to authenticate your identity. Once your identity has been confirmed, the process will continue. When we receive the information, our staff will review it, conduct the appropriate background checks, prepare, certify and mail your documents; simple and convenient.